As I’ve been gearing up to renovate the Kid’s/Guest bathroom I’ve been considering several different options for new flooring. As I’ve searched I’ve been very impressed by what I have seen in the vinyl flooring arena. Over the years it seems vinyl has gotten a bad reputation in the design world for being outdated and weak on the scale of durability. 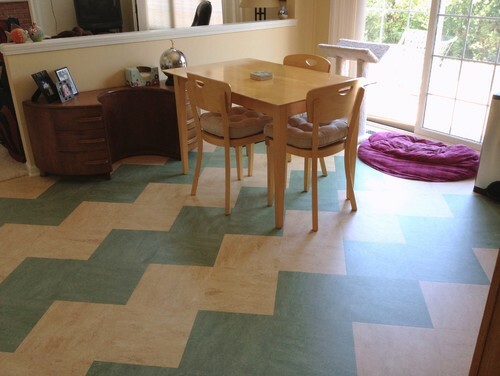 You may be surprised when you learn these following myth busters regarding vinyl flooring. 1). 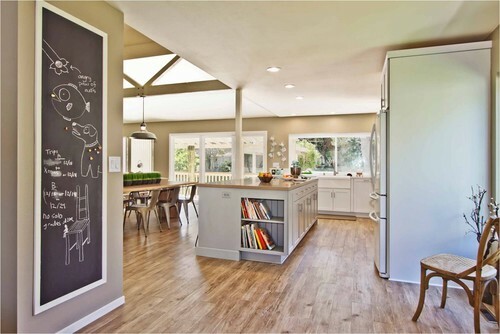 Vinyl flooring is outdated and unattractive. 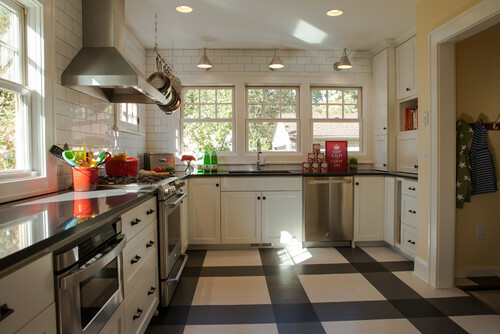 Vinyl flooring has come a long way in both looks and durability. I think for many people the term vinyl flooring conjures up images of one giant seamless sheet of vinyl rolled out onto the floor. 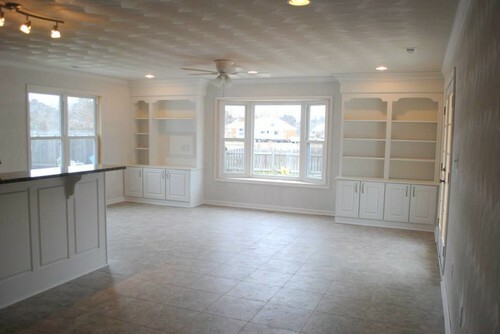 However, this is only one type of vinyl flooring. Two more contemporary vinyl options are vinyl tiles and vinyl planks. Vinyl tiles are pre cut square pieces of vinyl that usually come in 12x 12 inch or 18 x18 inch sizes. 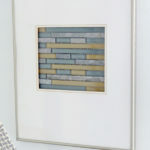 They are often designed to mimic the visual appearance of ceramic or other stone tiles. Over the past 5-8 years vinyl tiles have increased in popularity and it’s realistic appearance. 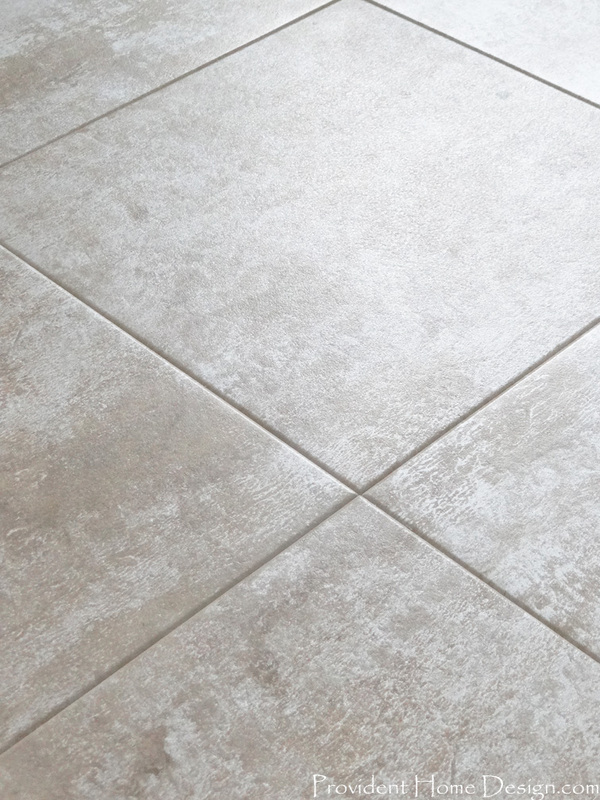 There are even vinyl tiles available that can be grouted in the same manner that ceramic tile would be grouted. 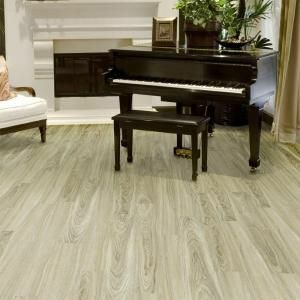 In recent years as hardwoods and laminates have taken the front stage of coveted flooring, vinyl is now being offered in vinyl planks. These vinyl planks are often 4-6 inches wide and 3-4 ft long. Their color and pattern can resemble hardwood so closely that from afar you would never know it was vinyl! A great “wood” vinyl option can be found, Here! (affiliate link used for your convenience). 2). All vinyl flooring is created equal. This is not so! 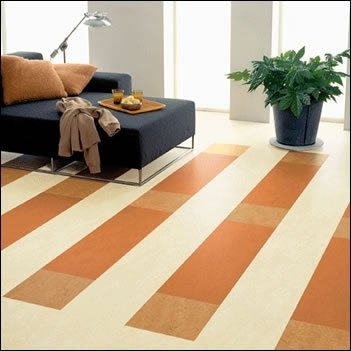 Vinyl flooring varies in quality and durability. The durability of vinyl hangs on two factors, the thickness of the vinyl and the finish. Thinner vinyl will wear more quickly. Hence, in most cases the thicker the vinyl the better the quality. Vinyl also has levels of durability based on the surface finish. For example, some vinyl has no finish, others a urethane finish, and the most protective finish is called enhanced urethane. It is important to pay close attention to these characteristics of vinyl as well manafacturer warranties and customer reviews when searching for durable vinyl. 3). 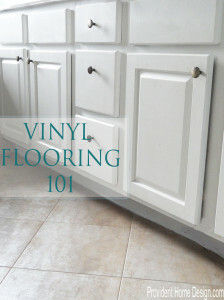 Installing vinyl flooring should be left to the pros. 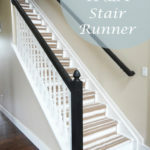 No way, especially with all of the stick and peel options out there this is totally a do it yourself project you can tackle even if you are a beginner. In fact other than painting walls this was my very first DIY project ever! It came about 9 years ago when i was using the bathroom at a friend’s house. 🙂 I liked her flooring and asked her about it. She told me she had used peel and stick vinyl tiles and had done it herself. What? I had no idea this even existed! So when we bought our first home a couple of years later and the master bathroom had 13 year old vinyl sheet flooring that had become worn and dingy so I asked her more about it. She told me all she did was clean the previous floors really well and then use good scissors and an exacto knife to cut the vinyl tiles when going around the toilet, sink, and walls. In tricky spots like the toilet you can use a 12×12 piece of paper as a template to draw the line around it and then trace it onto the vinyl tile (or you could lift the toilet if you know how). 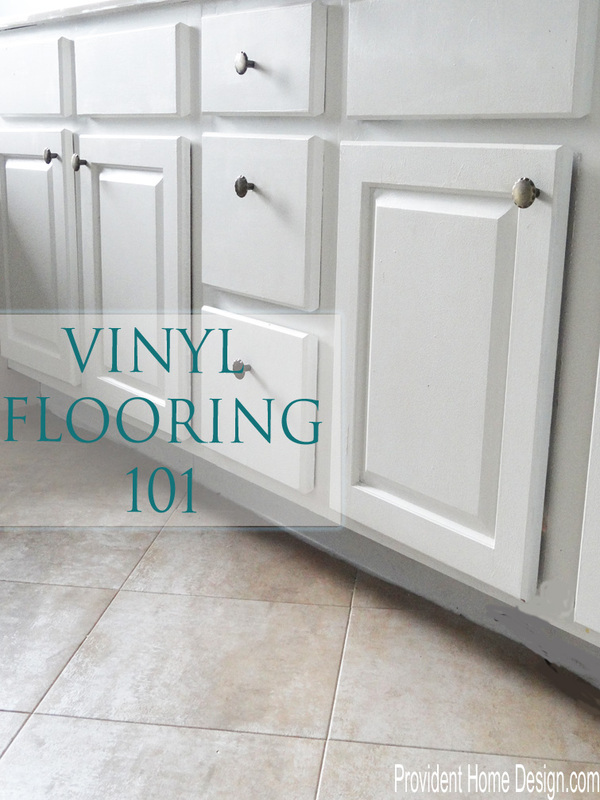 Anyways, here’s some links to how to lay a variety of vinyl tiles. Just know it’s definitely doable! 4). Vinyl flooring is a less expensive option to tile and laminate floorings. Surprisingly not always! Perhaps for a very basic sheet of vinyl or a solid color vinyl tile but not necessarily for some of the better quality look-a-likes. The solid vinyl tiles tend to be less expensive some are even as low as 50 cents a square feet which could be used to create fun patterns like the ones below. As I mentioned earlier I’ve been on the hunt for flooring for the kids/guest bathroom renovation and have been specifically looking at tile, wood laminates, and vinyl look-a-likes. 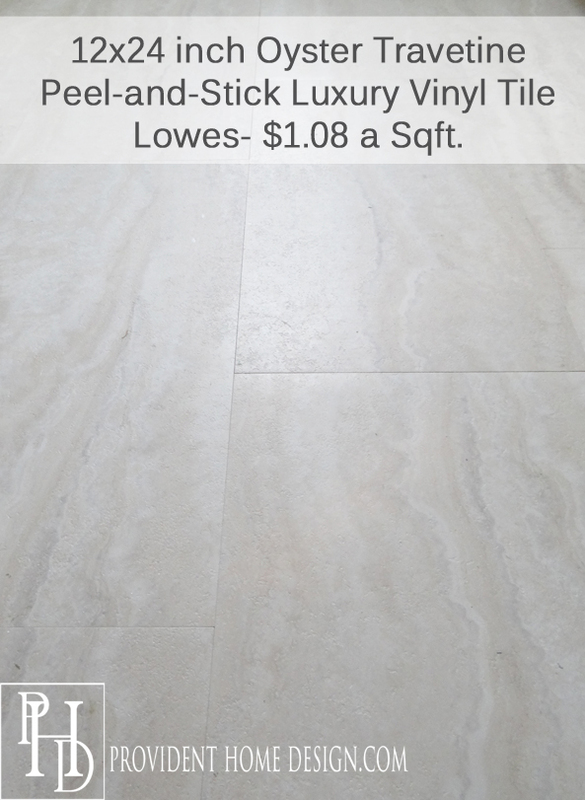 I have found vinyl tile and planks for as low as 89 to 99 cents a square foot, however, I have also seen ceramic tile and laminate flooring that low too! 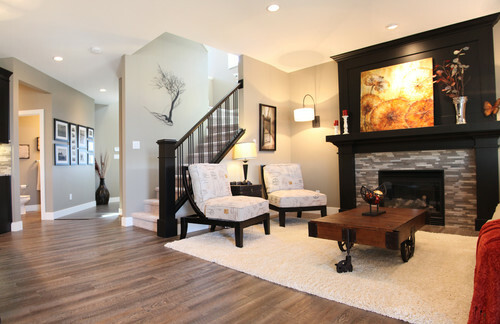 I think I’ve decided on Trafficmaster’s Allure Alpine Elm Resilient Vinyl plank flooring (shown below). 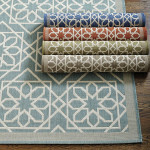 It has great reviews and is sold at Home Depot for $2.09 a square foot. But to prove my point there is also good tile and laminate and even engineered hardwood in that price range! I did score some vinyl peel and stick tiles at Home Depot clearanced at 33 cents a square feet to do my current master bathroom floors. One of the best $20 I’ve ever spent! 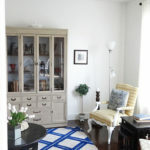 It is a great quality laminate and even a friend with very expensive taste thought it was tile! But that was lucky, most of the nicer quality vinyl will be closer to the $2 and up range. 5) If vinyl isn’t a lot cheaper than other options then there is no reason to purchase it. Vinyl actually has some great intrinsic qualities. Personally I prefer it over tile for several reasons. One, is it is easier on the foot. You can call me a pansy but I don’t like the hard feel of tile as well as how cold it gets in the winter (go ahead say it, I can take it) 🙂 I feel vinyl is more comfortable to walk on barefoot for these reasons. Also with children I worry with falls that they could become injured if they hit their head on tile. Vinyl seems like a softer, less dangerous material to me. 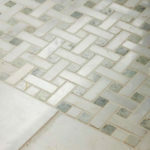 In addition tile requires more upkeep and maintenance. Right now we have tile throughout our foyer, kitchen, and half bath. 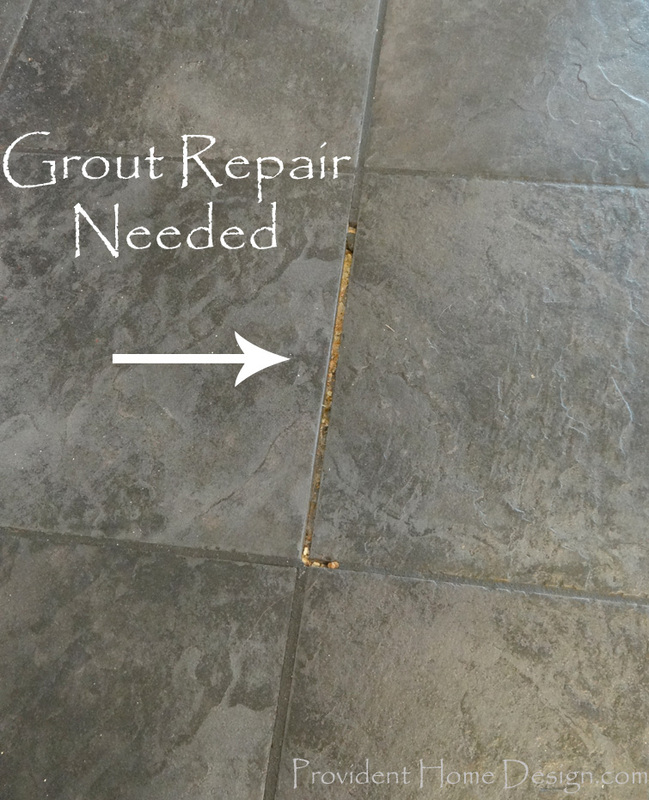 In a few areas the grout has become cracked and chipped away (as shown below) and needs repair. In addition, compared to laminates and woods it does better holding up to moisture and to nicks from dog nails and other wear. 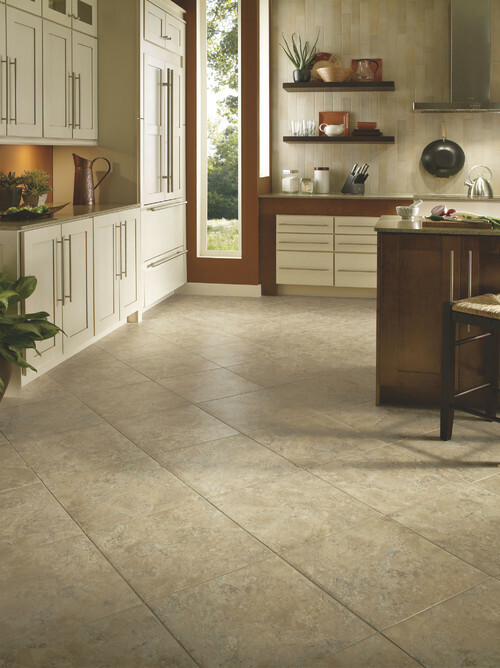 Lastly, although vinyl may not necessarily be less expensive as tile and laminate it is easier to install. So if you are able to install it yourself than you do save money by going the vinyl route vs. the tile or laminate route. I hope this post on myth busters of vinyl has been helpful! Do you have experience with vinyl? Do share! Great information, Tamara! Thank you! I know right, vinyl has come along way in recent years! As always thanks for stopping by, Jennifer!! I want to say that I put self stick tile in my basement 40 years ago. It has seen 2 floods and power washed both times and it is still sticking. So what ever they say it works and that was probably a new thing not like they have now. Thanks for sharing, Shirley! Being flood resistant is a pretty cool feature! We have armstrong vinyl in our foyer, it looks like slate and is very durable. It was NOT cheaper than stone/slate, but it is durable, beautiful and low maintenance. Thanks for this post! I love the ones that mimic slate. I bet it looks great! Thanks for taking the time to share your experience! Very helpful information. We will be redoing our bathroom soon and I have been looking at several flooring options to replace our old vinyl sheet floor. I installed Allure vinyl flooring in my kitchen last year, this year continued it into my dining room. After previously having porcelain tile, the vinyl is much nicer feeling and looks amazing too. The best part is that I was able to install it myself. Thanks for sharing your experience with it, Mel!! That’s a great question, Katie! I think a realtor would best be able to answer that question. 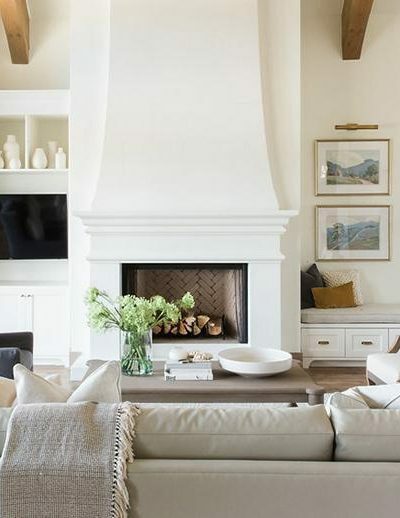 However, I think one of the most attractive things to a potential buyer is that the home is updated and visually appealing. 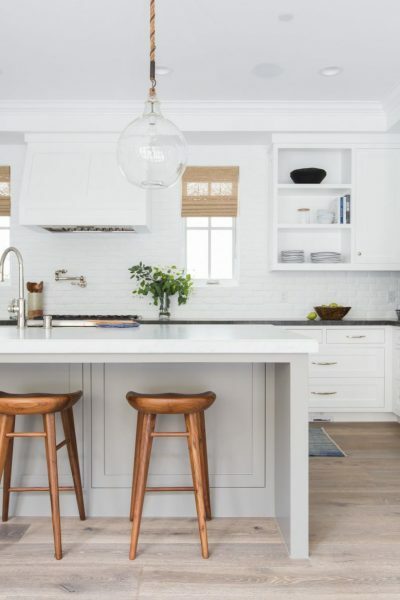 My personal opinion is that if you are using a good quality vinyl that mimics the appearance of stone, tile, or wood planks that you will be improving the look of your home and hence the likelihood of it’s sell. Great question! 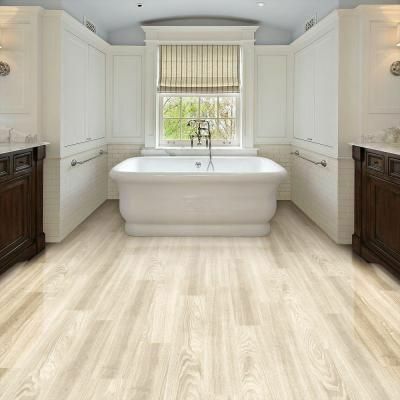 We are planning to use the same Allure flooring in our bathroom as well – but as flooring newbies, I was wondering how you’re planning to install it – any extra precautions for water, or just lay it down and go? I miss vinyl floors. They were warmer and softer than the tile and granite I have now. Also, anything that gets dropped on the tile gets broken. I’ve lost lots of glasses, dishes, Christmas ornaments and IPhone screens to my tile floors. Viva La Vinyl! Good point, Theresa! I’ve lost some glass items on my tile too :-(. Thanks for stopping by!! This is exactly what I needed to hear. We are currently deciding on flooring. We were iffy on the type but after reading this I think it’s a no-brainer. Christina, glad you got some clarity on your decision! Great post! 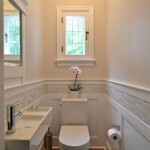 We put Trafficmaster Allure vinyl “wood” planks in our bathroom and love it! 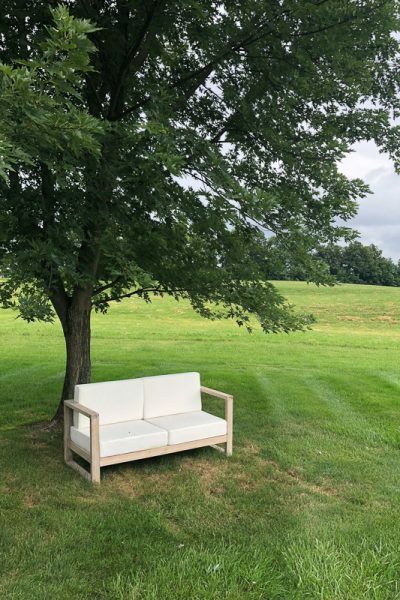 The look of wood without the worry and hassle. I appreciate you sharing your experience with it, Erin!! Great information; thank you! 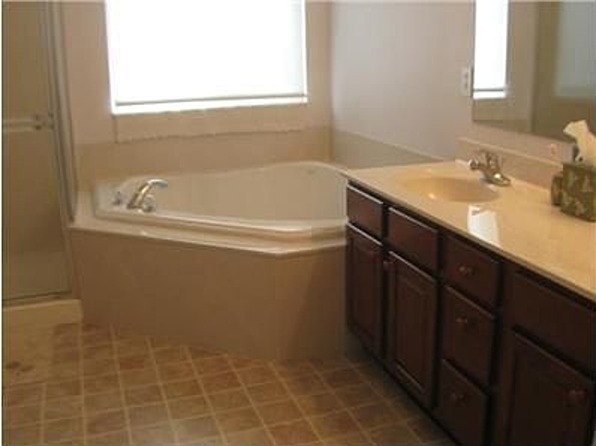 I’ve seen some vinyl flooring these days that’s really attractive and am thinking about redoing our hall bath, which is currently a shrine to the 1990s. My dad told me a trick about replacing vinyl (the kind on a roll, not the tiles) for a small room: Tear out the old flooring and use it as a pattern to cut the new vinyl in one piece to the exact dimensions — assuming the new vinyl is wide enough. Then you can lay the new in one fell swoop! 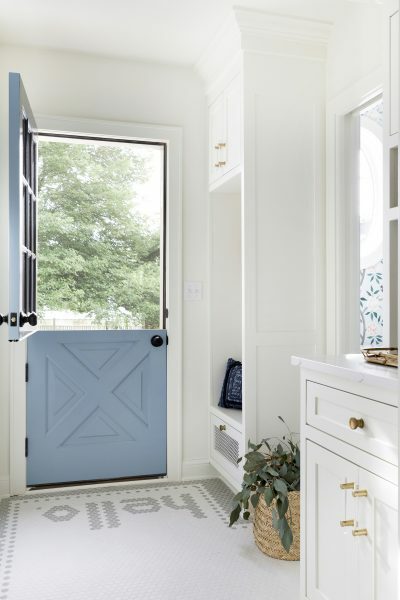 He did this once for a laundry room with a connected powder room and closet — all in once piece! I totally agree with all of your points! We have vinyl in our bathrooms, and we really like it. No one can tell it’s vinyl. They always think it’s tile until I show them and they have to practically put their nose to the floor to tell. I loved hearing your experience with vinyl! Thanks for sharing!! DiD you do it right over the old flooring or did you rip that up first? I’ve always just installed it right over the old flooring (which has always been vinyl sheets). Thanks for your question, Leshia! I put the Allure hickory in my old house as what started as a bathroom remodel. After 6 months we took all the carpet out and put it down in the whole house. I loved it and it’s extremely pet friendly. When we sold our house it and stainless appliances is what most of the lookers commented on. We are about to use it again in our new house. Thanks for sharing your experience with it, Tammy! 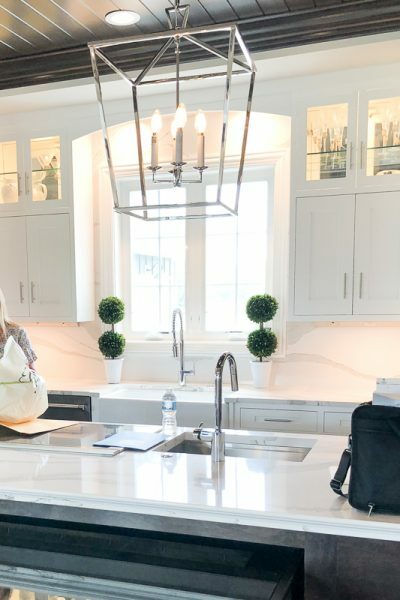 This is a little off subject but in the bathroom photo above, what type of countertop did you use? 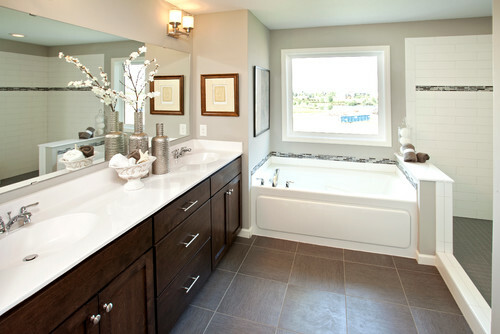 That bathroom shown above with the peel and stick oyster travertine is my exact bathroom and vanity. I need to replace the mauve tile countertops in my master bathroom desperately! 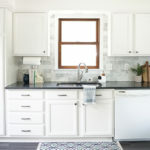 Is grouting required for the vinyl tiles? I put vinyl tile and grouted it in my kitchen and it looks so good. I knew I couldn’t afford the marble flooring I wanted and did find anything else I liked. I was really surprised when I saw the sample at Lowe’s of it grouted and knew it would make a nice “for now” floor for me. Once it was in I LOVE it. I’ve lived in my house a little over a year and I still love it. 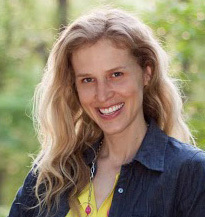 Your floors sound awesome, Andi! Thanks so much for sharing your experience! I just finished installing floating vinyl plank flooring in my kitchen. The worst part was waiting more than 8 weeks for it to arrive in the store. My kitchen floor is beautiful and everyone that has seen it thinks it’s real wood. Next, I have picked out the oyster travertine vinyl peel and stick tiles for the bathrooms and entry hall and laundry room. Thanks for this post as I enjoyed reading all about the advancements in vinyl. 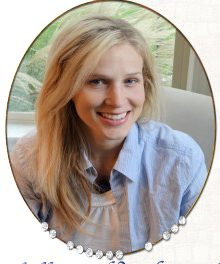 Well, I am so glad to have stumbled upon this blog. I to am a do it yourself girl. I am not afraid to try to do the job myself. 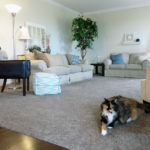 .we have purchased our wonderful generic dominion home 9 years ago and now that the kids are about grown-up and I have more time I decided it was time to update the house. Boy when I found the peel and stick vinyl planks on clearance (3 boxes for $50) I was giddy with excitement.well the guy at Lowe’s tried to get me to pull up the old vinyl and get all the extra stuff “required ). I thought nope, I will try it my way. Really it couldn’t have gotten any worse than the existing 17 year old vinyl lol. So I cleaned up the floor really good, laid the new floor and since I didn’t take the baseboards of, I finished the job with 1/4 rounds. I was until now afraid I did it wrong, however the floor looks great and everyone thinks it is real hardwood lol. 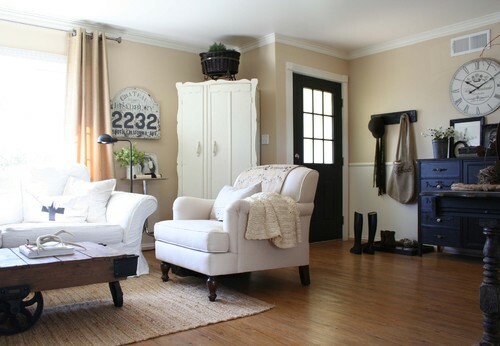 So yes this is definitely a great way to update your house without the expense of hiring someone. Floors look great! I actually have a question about your vanity. 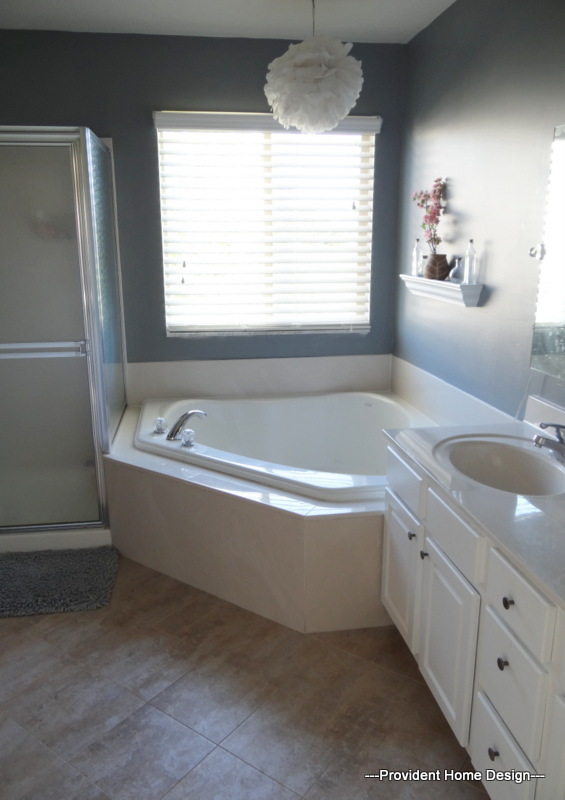 How did you paint between the tub and vanity? I have a vanity that isn’t right up against a tub but the space is also too small for me to get into. It’s like the couldn’t decide! Thanks!! Hi, Puna, hmmm sounds like a tricky scenario! Are they so close together that the side of the vanity cannot be seen?